There are no short cuts to perfect hygiene if your goal is to produce milk of the very highest quality consistently. An important natural food, milk is highly susceptible to contamination and deserves our special attention. Modern dairy farming technologies and an increased consumer awareness have made us realise that the role of hygiene in every step of milk production has reached a new level. Products for cleaning the outside of the milking machine. Full details of all the products can be found in the hygiene section of the GEA website. According to research by the Health and Safety Executive, agriculture has one of the highest rates of death and serious injury of any industry in Great Britain. With this in mind GEA Farm Technologies is committed to doing all they can to improve the health and safety on UK dairy farms and will be running a number of initiatives to help do just that. The first of these initiatives will be issuing out Safety Data Sheets to ensure the safe use of GEA and Agroserve dairy hygiene products on British farms. Safety Data Sheets provide information on chemical products that help users of those chemicals to make a risk assessment. They describe the hazards the chemical presents, and give information on handling, storage and emergency measures in case of an accident. 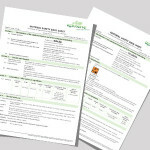 To find out more about Safety Data Sheets visit www.hse.gov.uk/coshh/basics/datasheets.htm.